March 2015 Photoshop course – This kicked off my thinking and opened my eyes a little bit. April 2016 concept imagined – Away from work and the pressures of everyday life, I was laying on a sunny beach listening to the sea gently lapping against the shore and my mind started to wander. At this point a little bit of magic happened and the outline for Lets Call Bull was imagined. September 2016 concept documented – Away from the stress of everyday life (and on a beach again!) the little idea that I had in the back of my mind got some airtime again. I realised that this was something that I just had to do as I passionately believed that there was room for something like Lets Call Bull and people would ‘get it’. Realising that this website wasn’t going to create itself I started madly making notes about the concept and made a more formal written brief for Lets Call Bull and how it would work. October 2016 looked for web designers – Back in the real world and after realising that this wasn’t something I could to on my own I started looking for web designers, only to find that a lot of companies didn’t have the expertise to create the ‘Bull’ rating system that is central to the site. When I met with Kevin @ Multi Layer Media to ascertain capabilities and approximate costs it was obvious that these guys ‘got it’ and could help me bring this to life. December 2016 full page layout and functionality brief given to web company – The world got in the way again between meeting the web company and kicking off the formal creation of the website but we made it happen. I had 2 thoughts in my mind, firstly “this is it Lets Call Bull is finally going to become real” and secondly “gulp this is gonna cost a fortune, but it’s going to be worth it if it helps people to get to the truth”. February 2017 Logo brief started – This was another big milestone as we realised that to have a unique feel and character to Lets Call Bull we had to have logos and icons that were easy to recognise and represent the Truth or Bull elements. We worked closely with #Dean Usher who did a cracking job of helping me tease out the ideas and create the logos and icons that you see all around you. March 2017 Logo completed and first look at the new website – This was a big month for LCB and hugely exciting. 2 years after the initial seed was planted to finally see how the website would look and an indication of how it would feel when completed was amazing. April 2017 First live walk of the Beta website - This was so exciting as it was a chance to really get a feel of how the site would work, and I have to say I loved it (and I hope you do too!). 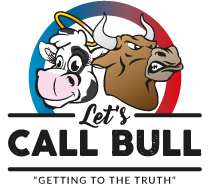 May 2017 Lets Call Bull goes live for Alpha testing – This is it the site is now up and working in the background and if you happened to chance across www.letscallbull.com you will see a holding page with the logo on it and a ‘coming soon’ teaser. June 2017 Beta testing commences – The site has been tweaked, tested and populated with content as much as possible and is now open to a small set of Beta testers to play with (or to use the more official term ‘to finely tune what you see in front of you now’). February 2018 Facelift for the site – Or to be more precise we have changed the voting process so it’s easier to understand and use. It’s now TRUE or BULL with no gradient from 1 to 10 and we also have a reminder to vote added after the story as people were forgetting to! June 2018 Our 1-Year Celebration – The site has been open to the public for a year, to say thanks we will run a free £50 Amazon Voucher Prize Draw for all our users to enter as just a little way of saying THANK YOU for helping us grow. September 2018 10,000 Unique Stories and Articles Uploaded – We have hit a massive benchmark number with over 10k articles that people have called ‘True’ or ‘Bull’ on now uploaded onto the site.